nature's revival is surely a remedy for everybody. my mood instantly changes when I pass by green pastures, blossoming trees and cute little lambs. I spent most of the weekend outdoors even though moody miss spring decided to paint the sky with some clouds and dropped a few rain drops on us once or twice. but even in this light, everything is so beautiful you can't help but feel joyful and energetic. 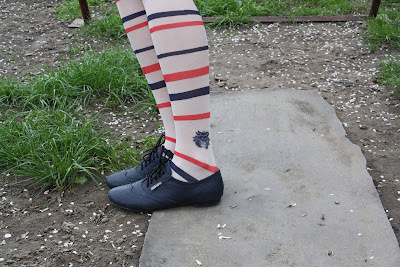 I knew I wanted to play a bit with my outfit, so I pulled out my stripped tights. they're so much fun, they remind me of lollipops and on my left leg you can see mr crab, just hanging out. paired them with a deep purple dress with a beautiful pleated bottom and dark blue shoes. it turned out a bit too matchy matchy, but that's a thing I need to work on. I guess I still have my fears of putting too many colors in one outfit. oh I love this!! Those tights are soooo cool! This is such a fun outfit! your tights are fantastic! I LOVE the stripes! I'm glad I found you to cause you seem so sweet and nice and have great sense of style.